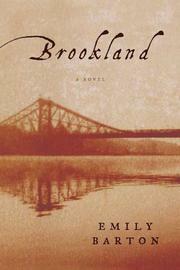 An 18th-century businesswoman plans to build a bridge across the East River connecting Manhattan with the villages then known as “Brookland,” in New York author Barton’s industriously researched second novel. In a narrative that juxtaposes precise reminiscences with letters written to her married daughter Recompense, Prudence Winship Horsfield tells how she inherited the profitable gin distillery created by her father, Matthias Winship; overcame her own weaknesses and the envious condescension of men who resented her boldness; and realized an improbable dream that eventually failed to weather a hard winter. Prudence is a formidable character who quickly learns the intricacies of the distilling process (while still a pre-adolescent), achieves a successful marriage to her childhood friend Ben Horsfield (a trained surveyor, and her bridge-building partner) and earns the financial backing of tight-fisted state politicians. But there are darker currents in “Prue’s” life, directed by her brusque, unloving temperament. The “curse” young Prue pronounced on her unborn sister Pearl seems to have caused the “affliction” that robs Pearl of speech, and likewise poisons Prue’s relationships with her mother Roxana, the embattled Pearl and youngest sister “Tem”(perance), Prue’s temperamental opposite. Still, Prue perseveres, labors, studies (learning that she can employ “the principle of the lever” to create her bridge). But destiny is not denied. Delays, fatal accidents and a new governor’s withdrawal of funding, all work their will. A frustrated Prue angrily threatens the longsuffering Pearl’s last best hope for happiness. And everything Prue had embraced and envisioned proves as unstable as it had once seemed impermeable. No historical novel in recent memory has amassed such an imposing wealth of rich period detail, and few novels of any genre extend an increasingly absorbing story to such a powerful, sorrowful conclusion. A brilliant book that should be a strong Pulitzer Prize contender.